Your resource for all things shoegaze and dream pop: WTSH airs TONIGHT on DKFM! Stream it live @ 10pm ET/9pm CT.
WTSH airs TONIGHT on DKFM! 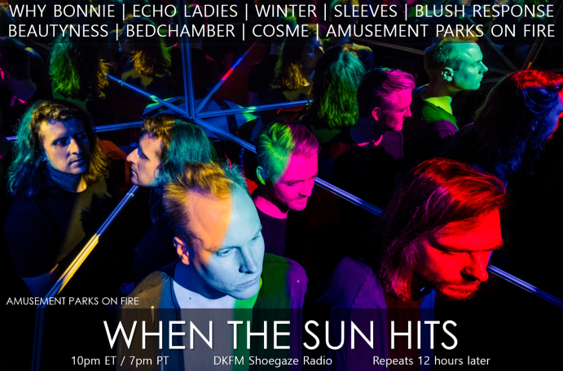 Stream it live @ 10pm ET/9pm CT.
Tonight’s sparkly bits provided by Echo Ladies, Amusement Parks On Fire, Blush Response, Landing, Winter, Beautyness, Terra Pines, Why Bonnie, Sleeves, Bedchamber + MORE! Stay tuned in to catch The Somewherecold Radio Hour at 12am ET/11pm CT! WTSH 116 is now streaming on Mixcloud! NEW ALBUM REVIEW: Foliage | III + NEW VIDEO.